Britain's Gainsborough Pictures existed for about 25 years beginning in 1924. They'd made dozens of films in that time period but never really achieved a great deal of popularity until the mid-40s when they started making a sequence of pulpy, escapist fare that have come to be known as “Gainsborough Melodramas”, and were some of the most financially successful films of the era, due to their intentional break with British Cinema’s realism of the time. 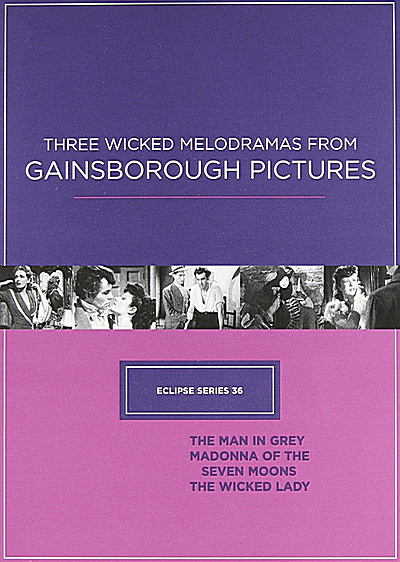 Amid the tumult and tragedy of World War II, Gainsborough Pictures unleashed a series of unrestrained costume melodramas focused on taking audiences (particularly female audiences back home) away from their troubles and allowing them to lose themselves for a couple of hours in the pomp and pageantry of an earlier, more elegant period. Having been excluded from the class of production deemed suitable for awards or critical acclaim, the Gainsborough pictures have been bypassed by film critics despite featuring interesting casting choices, including the debut of star James Mason. Eclipse has chosen three of the most popular for this arresting series: Three Wicked Melodramas from Gainsborough Pictures. All three films are full of passion, intrigue, betrayal, adultery, murder, violence, and pretty much everything else the war-rattled British public were hungry for in a time of more somber films. This tale of treachery put both the Gainsborough melodrama and actor James Mason on the map. The star-to-be plays Lord Rohan, a cruel nobleman who marries the naive and sweet-natured Clarissa (Phyllis Calvert) for the sole purpose of producing an heir; meanwhile, Clarissa’s conniving best friend, Hesther (Margaret Lockwood), secretly plots against her for her own nefarious ends. The Man in Grey, directed by Leslie Arliss, was such a box-office success that Gainsborough used it as a template, launching a cycle of increasingly rococo films. A lurid tale, Madonna of the Seven Moons, directed by Arthur Crabtree, is among the wildest of the Gainsborough melodramas. Set in Italy, it begins as a relatively composed tale about a respectable, convent-raised woman (Phyllis Calvert) who is haunted by the memory of being raped as a teenager. When her grown daughter returns from school, her life begins to crack up in monumentally surprising ways. Stewart Granger also plays a prominent role in this sensational tale. Margaret Lockwood devours the screen as a tightly wound seventeenth-century beauty with loose morals, who steals her best friend’s wealthy fiance on the eve of their wedding. And that’s only the beginning of this piece of pulp from director Leslie Arliss—there are no depths to which this sinful woman won’t sink. James Mason costars, and nearly steals the movie, as a highwayman with whom our antiheroine becomes entangled. This nasty, subversive treat was the most commercially successful of all the Gainsborough melodramas.